Matthew Teismann, lecturer of interior and spatial design and partner of LIONarchitecture, recently completed the instruction of a design studio at the University of Technology Sydney. Teismann's students, nineteen in total, were given the task to critically interrogate the pedagogical direction of architecture and design schools in the twenty-first century. 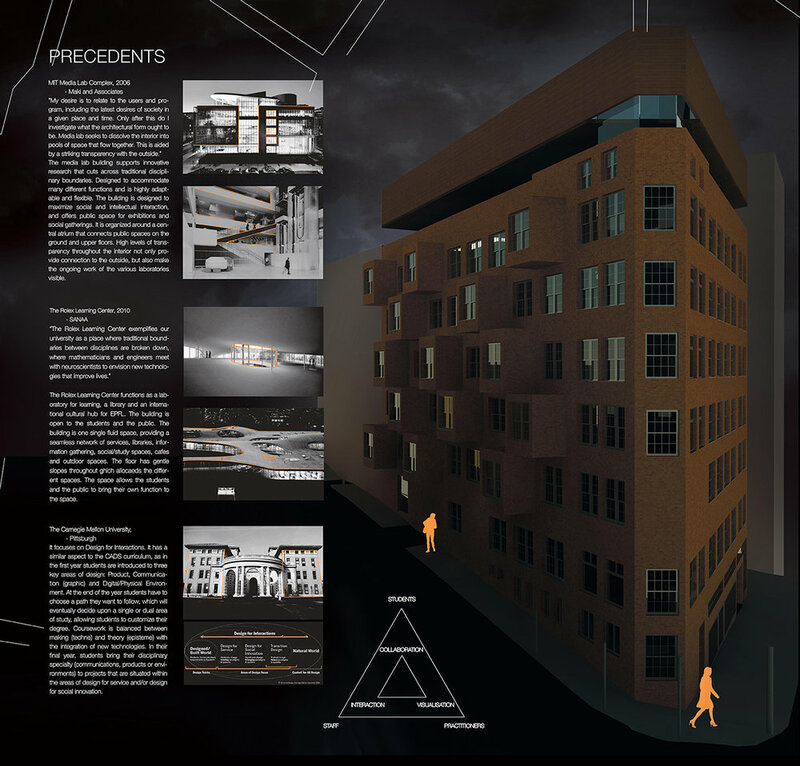 The students of Teismann’s studio presented their schemes on Friday November 6, 2015 to a committee of four jury members. 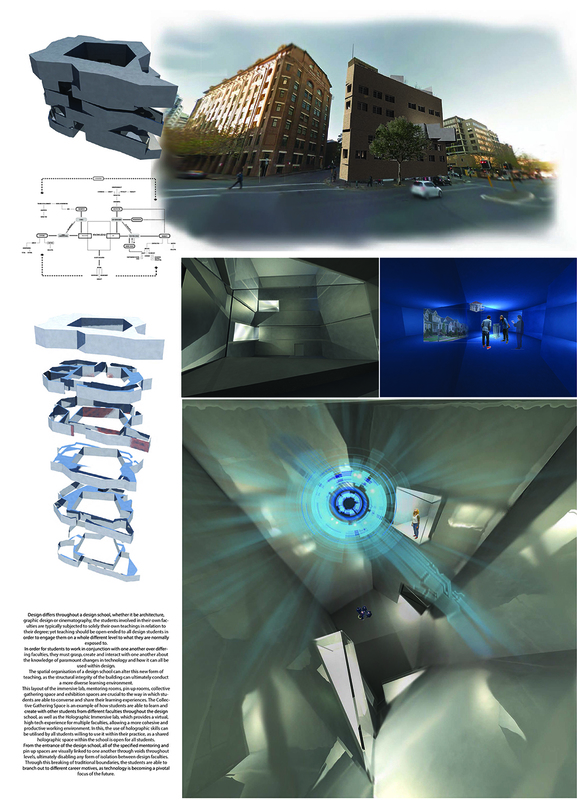 The work each student presented included individual designs for a design school in Sydney, which included process work from conceptual design, design development, and final design presentations. Moreover, their work was exhibited at the 2015 Interior and Spatial Design Graduation Show on November 11th at Pier2/3 to an estimated 1,200 guests. This work is part of a larger investigation that LIONarchitecture has been undertaking over the last year to re-imagine how design education can holistically respond to and anticipate the hybridization of society as described by Bruno Latour. This interconnected musing we offer below form part of a radically rethought architecture-school curriculum we are using to formulate a speculative 21st-century design school embedded within an anthropological-network inspired by Bruno Latour's actor-network theory. Once LIONarchitecture has developed a project-proposal based on this research, we will publish our findings on the websites. What are the implications, we ask, of this on architectural design, in a world in the which architects have been given the responsibility to response to - and initiate - solutions in a localized context, yet paradoxically aimed at global impact. In other words, a a contradiction exists between the architect's means of engagement (site-specific local building) and the 'hoped-for' expected outcomes (significant global change in perspective). How can Latour's Actor-Network Theory ameliorate these incongruities? Either through changing the impossible expectations of the discipline and practice of architecture or through an altered means of engagement in their arena or operation that is itself globally hybridized. As architects, we choose the latter. Bruno Latour defines a network as the interaction between science (technology) and society (culture) through a given epistemic framework. Crucial to this definition is that knowledge not be tied with past achievement. We attained this knowledge, but knowledge is being re-interpreted, uniquely connected, or discovered anew. It is the way society engages, or frames, a given episteme that defines knowledge - the way it categorizes the collective - that constitutes knowledge. It is, thus, always in flux. More concretely, in the role of design education, networks are neither optic nor solely human. Architects think of networks like geometry, or math, insofar as they operate in the physical world (arena of operation), yet exist immaterially within a societal mind. Architecture engages similarly. It is not a 'thing-in-itself' nor merely humans about themselves. An anthropologist, like a rational ethnographer, can reveal a single narrative through a given - or constructed - network. The architect engages this episode, not with an intervention [as that implies disruption), but an interweaving that is just. Architecture is revealed only when it engages this larger network. It moved beyond autonomy into sublated absorption. As such, technology - the way it is produced and the way it produces us - is far reaching in its arena of operation, from cosmology to architecture and beyond. This is what we at LIONarchitecture have always been - and still are - after. Here Latour is alluding to the Cartesian divide supposing distinction between subject and object. Architectural education seems to accept this false paradigm - whether on behalf of the autonomous object or social agency of design - as if they are not one in the same. We must not think, therefore, that aspects of architecture form 'parts' of a larger network that includes politics, economics, and technology; rather, architecture is embedded within the self-same network that Hegel would call the Zeitgeist, or ethnographers might call the Anthropocene. At the beginning of the 21st century, the ways in which we understand, produce and communicate knowledge are undergoing fundamental changes. This studio addresses the ways in which spatial organisation reflects these changes that are inextricably linked to technological innovation and challenges the way in which spatial practices relate to the production of knowledge. Five architectural typologies, the library, the research institute, the laboratory, the museum, and the design museum, are moving toward a transgression of typological boundaries and towards performative conditions of living and working. This design studio features and challenges the technological, cultural and social aspects that are innately related to the localisation of knowledge production, communication and dissemination. Educational institutions are at a precipice between analog and digital techniques of instruction. Following early twenty-first century trends, the next 10-20 years are expected to exhibit a complete revolution in the dissemination and acquisition of knowledge through computation and cyber methods. With technologies such as the internet, 3-d visualizations, and holographic representation, the ‘physical object’ is on the verge of being dethroned. Beginning with the pedagogy of the Bauhaus, this studio interrogates the way a re-imagined design school can interface with emerging digital technologies to assimilate with, and produce new means of technological knowledge. The Centre for Advanced Design Studies (CADS) is a hybrid institution that focuses on speculative potentials of built and cyber environments: architecture, film, and graphic design. Re-imagining an existing building site in Sydney, the spaces will activate collaboration between distinct disciplines through advanced technological means: cnc-robotic milling, nanotechnology, and biomaterial production. We examined how cyber-interface can influence spaces of instruction, especially lecture and studio environments. We asked questions like how does a digital environment relate to physical space? Is physical space any longer necessary? How can emerging technologies of fabrication foster an understanding and communication of new knowledge beyond the traditional learning environment? The design project itself was an interdisciplinary design school where traditional barriers between disciplines are destroyed. Each student’s design school proposal was expected to emphasize the copious aspects of design production, including designers of the built environment (architects, interior designers, urban designers), filmographers, and applied arts (graphic designers, product design and development). What about an interdisciplinary design school can create a more productive learning environment? How can these different groups coalesce to imbibe creative space? To begin the semester each student developed a curriculum that includes and interweaves the respective groups (listed above) into the context of 21st century design education in Australia and the globe. The student was in charge of diagraming, mapping, and presenting this curriculum for their speculative project. 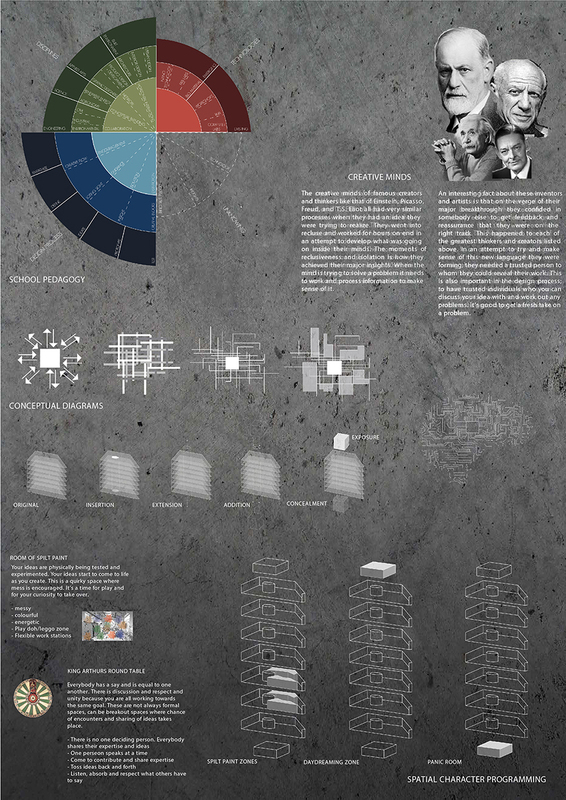 This curriculum was then used to structure the spatial and architectural formation of their project, and informed the development of the full project brief through group charrette. Each student was expected to master the development of the particular typology of a design school through the development of innovative environments, spatial relationships, and re-imagined curricula. Each student was responsible for a comprehensive project that may – in the end – be unconventional, dangerously forward-looking, yet altogether rooted in the shared knowledge of human education and development. They considered how people actual use spaces, but even more so, the implications resultant from the use of these spaces. By the end of the semester, it was expected that each student had developed a stance on the following question: if design education follows the same trends that other educational institutions are moving toward (in particular cyber-instruction), what are the future implications on physical space when education is digitized?